Praz-Delavallade is glad to announce the third solo exhibition of the Swiss artist Philippe Decrauzat. 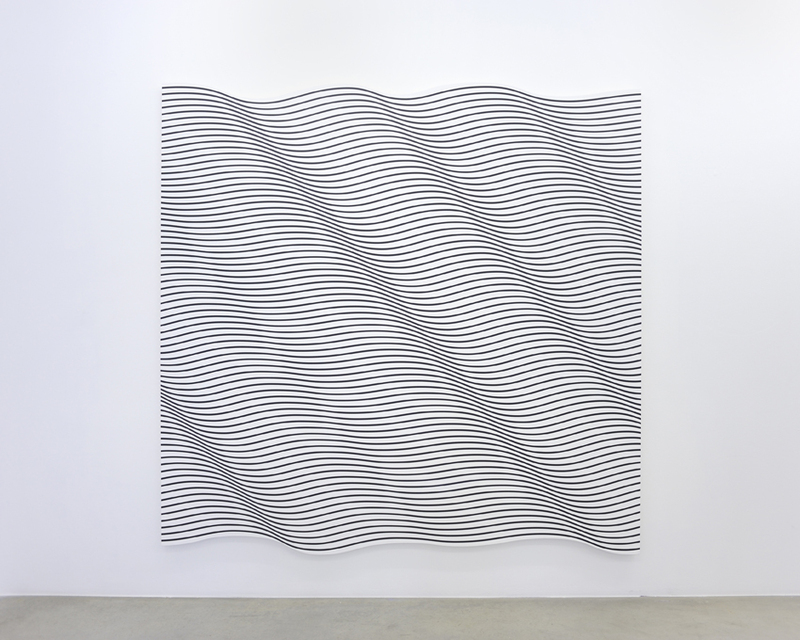 The first room in the rue Louise Weiss gallery displays an installation of five canvasses extracted from an undulating continuum divided into five different sequences: five shaped canvasses. Indeed, the frame of the canvas follows the undulation suggested by the motif, but only up to a point since the sides are sharply cut off. Comparing these to the corresponding series of paintings, it appears that the deductive logic governing the forms is abandoned, the frame is deduced from the pattern only for part of it. Each of these canvasses represents an excerpt from a longer sequential line, placed in the space out of order in a break with continuity. 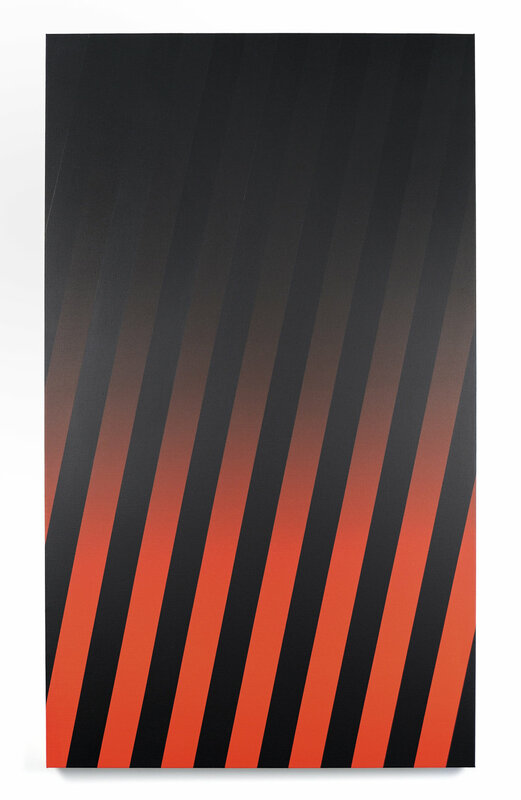 Decrauzat stresses the illusion through an undulatory motif borrowed from op art as applied to his big scale Shaped Canvasses. As a result, the viewer finds themselves physically involved through immersion in a perceived experience that situates him an authentic de-construction, a kind of freeze frame shot. 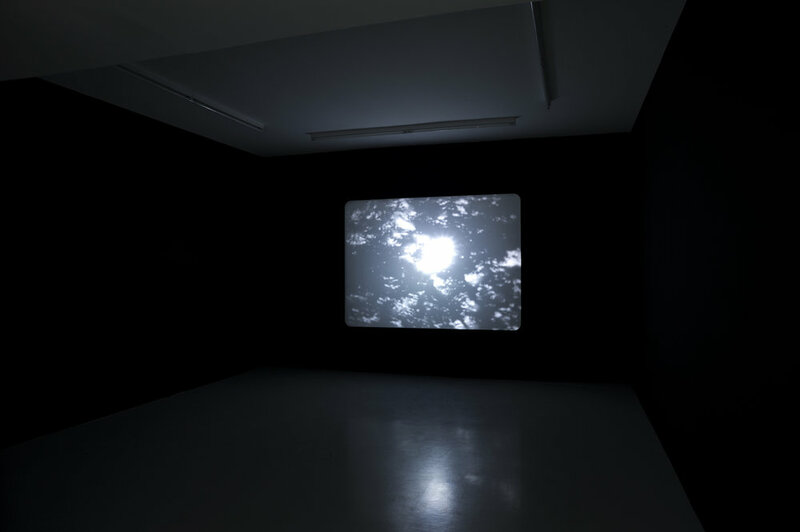 The way the artist displays the works in the space and the concept of the paintings themselves is close to motion picture editing technics and point to Decrauzat’s interest in experimental movies and optical technologies. As a matter of fact, the concept of perception lies at the core of that kind of optical cinematography. This indeed is what Decrauzat explores in his third film shown in the second room: “screen-o-scope". As in his previous films, Decrauzat uses no camera. He works from images excerpted from sundry sources. Here he draws from the motion picture Rashomon by Akira Kurosawa (1950), extracting pictures he will use in a different context. Rashomon consists of a time-warped narration in which versions of the same event, a crime, as perceived by different witnesses are retold. The images chosen by Decrauzat come from the key scene of the film which takes place in a forest, with the camera focusing on shimmering light as seen through the trees. In Kurosawa’s film, these views serve as a transition to indicate a change: passing from the subconscious to the conscious for the female character, or backtracking in time for other witnesses. Decrauzat takes these images of sunlight shining through trees as a base for his work: contrasts are emphasized while shadings are erased in order to obtain a more graphic and abstracted image. These shots reveal some of the artist’s recurrent thoughts, namely his interest in pulsating light. These shots also bring to mind the very circumstances in which Brion Gysin conceived the idea of the Dream Machine. And thus, Decrauzat’s editing or montage creates a pulsating effect that inescapably captures the viewer in its syncopated pulsation known as a flicker effect. Dazzlement, the temporary blindness caused by staring too long into the sun, has often been studied as part of visual function and optical phenomena. These images from Rashomon conjure up a conception of perceived vision based on the sun’s observation and lead to the very process of motion picture projection. 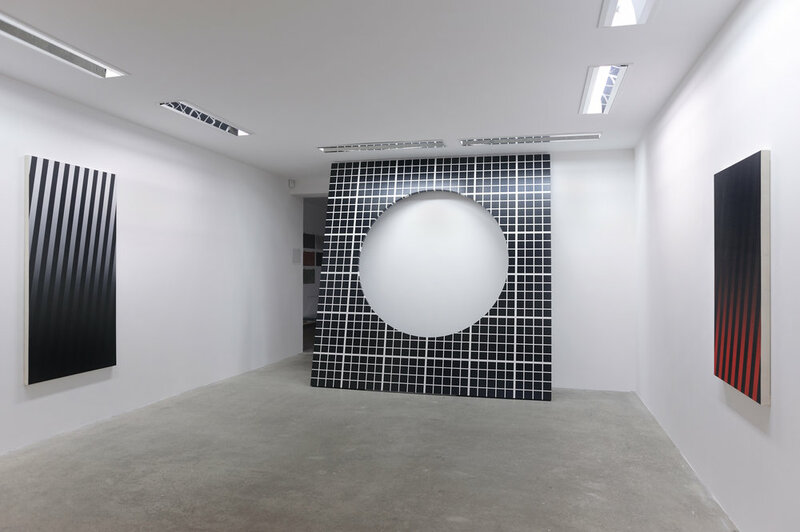 In the second gallery located at rue Duchefdelaville, Decrauzat picks up this score of variations on the the theme of luminous effects (black to white, and white to black) in a series of striped canvasses. 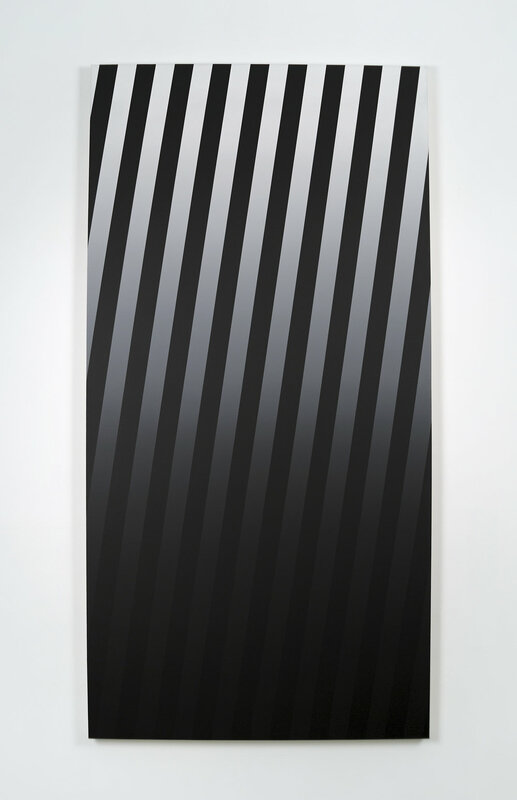 Through tint gradations, like the addition layers ranging from black to white, he gives form to a moving visual transition.